Green Burials collection of Scattering Tubes are designed and engineered to simplify the scattering process. The tubes are durable, dignified and simple to use. Each features a convenient removable lid and an industry-first, perforated “push in” tab that opens easily prior to scattering. The Scattering Tubes contain no metal or plastic components and can be recycled or composted after use. Suitable for “in-cabin” airline transportation. 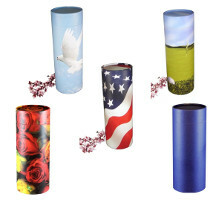 The top of any adult or mini Scattering Tube can be personalized. Simply complete the online order form, upload a photograph, and we’ll do the rest. Same day turnaround is available when approved artwork is received by noon MST.